Union plumbers in the Philadelphia area date back to 1827 when they helped organize the mechanics union of trade organizations. There were many attempts over the years to form an International Union. Finally, on October 11th 1889, the United Associations of Journeymen Plumbers, Gas Fitters, Steamfitters and Steamfitters Helpers of the United States and Canada were organized. A group of dedicated Plumbers secured a charter for Philadelphia from the U.A. on May 12th 1900. This was the beginning of Plumber’s Local Union 123. The initiation fee was $10.00 and the dues were .50 cents per meeting. Two meetings were held a month. Due to the depression, the tough economic conditions of the day forced the ending of local union # 123 and the beginning of Plumbers Union Local #690 soon to place. 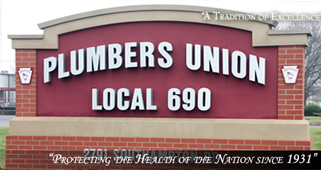 A new charter was issued by the United Association on March 25th, 1931 designating Plumbers Union Local #690 of Journeymen Plumbers and Gas Fitters of Philadelphia, PA. There were 205 members at this time. The great depression was in full bloom and jobs in the trade were practically non-existent. Plumbing and Heating Supply House Employees Chartered April 9th, 1937. Junior Journeymen Plumbers and Apprentices Chartered August 3rd 1937. Local Union 403 of Chester, PA. merged into Local 690 in April of 1938. Gas and Service Fitters-Meter Readers and Apprentices Chartered October 8th, 1938. The U.A. changed its name on September 13th, 1946 to: United Association of Journeymen and Apprentices of the Plumbing and Pipefitting Industry of the United States and Canada. Speculative Housing Division Chartered May 1962. Local Union 42 of Reading, PA. Merged into Local 690 in June of 1972. Local Union 428 of Norristown, PA. Merged into Local 690 in June of 1972. Local union 670 of Allentown, PA. Merged into Local 690 in June of 1972. Today, Plumbers Union Local 690 of Philadelphia and Vicinity has a membership of Twenty-Two Hundred working to provide ten counties with safe gas, water and drainage systems.